St George Island Florida has both a State Park and a Lighthouse on different parts of the Island. 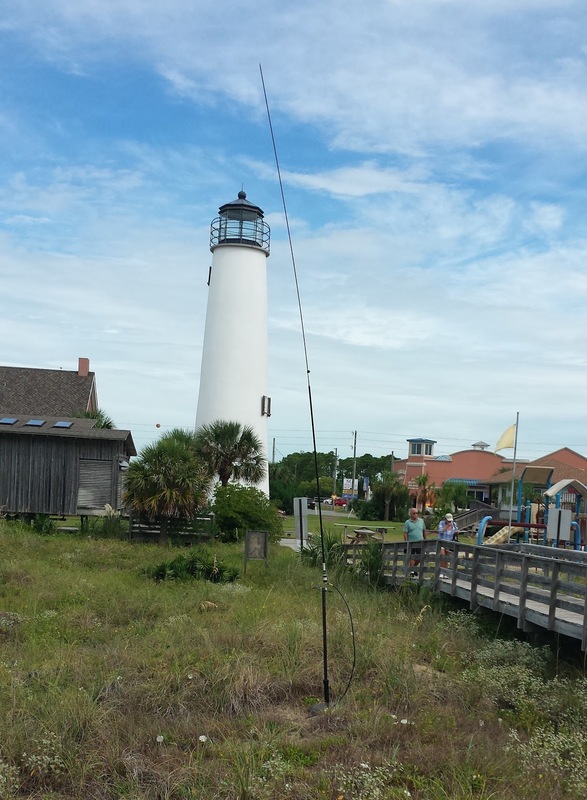 St George is FL007S in the US Islands directory. Saturday was the W/VE Island QSO Party. Linda my wife and Suzy our Basset made this a get-away weekend spending Friday and Saturday night at the St George Inn which is a block from the Lighthouse. 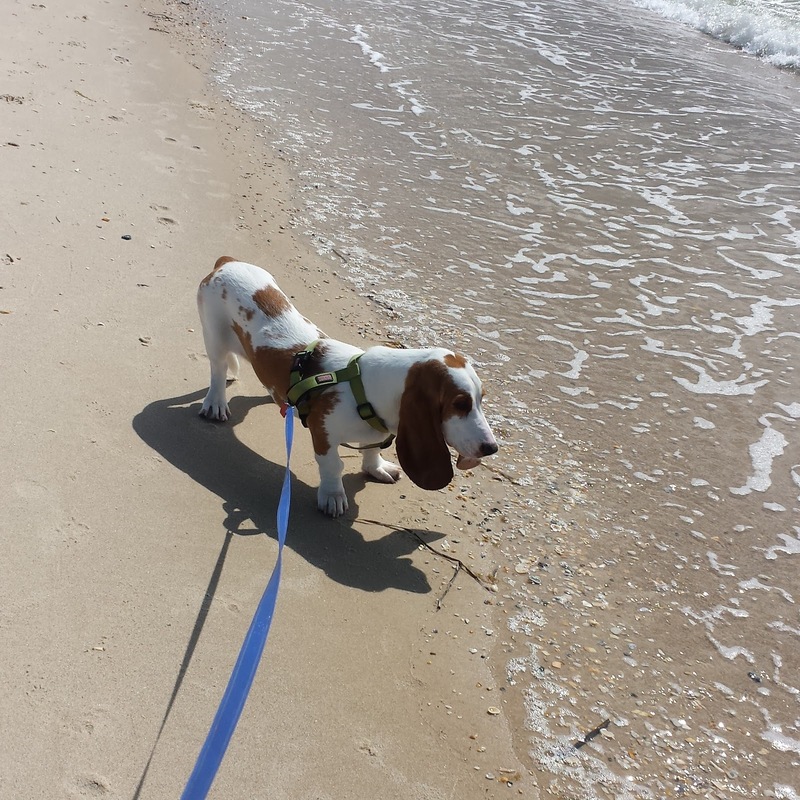 First of all, the island is very popular with dog owners as dogs are welcome on the beach. So Suzy was right at home, she enjoyed the bed at the hotel, the beach and met many other dogs over the weekend, There is access to the beach right behind the Lighthouse. This expedition became a Panama City ARC Club event as well. I operated with the club call W4RYZ. Bob KK4DIV and his wife Carla arrived Saturday morning from Panama City. Bob used a portable generator to power his FT-450 rig. I had contacted the Lighthouse Association and had permission to use the light as support for an antenna. 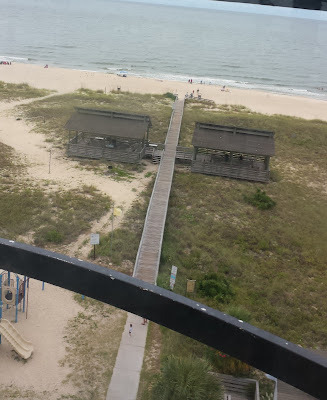 However, the Lighthouse did not open for climbing because of lightning in the area. I setup at one of the pavilions near the beach instead. I used the Icom 7100 on battery power and a Chameleon Hybrid Micro with a whip. I got in an hours operating and picked up five islands. Setup from the beach pavilion looking toward the light. I went to pickup Linda and Suzy and had lunch. On our return, Vic K4GXV his wife Sally KD4UUN, Bob WB4BLX and his wife Linda KG4TJL arrived from Panama City. I decided it was time to setup an antenna on the Lighthouse. I was not as easy as it sounds. I took 150 feet of line to the top of the light. The line became a huge tangled ball. So I had to unravel it which must have taken 30 minutes. After that I got Vic and Bob's assistance to deploy a Chameleon Tactical Dipole Lite. It was inverted vee style with the top about 55 feet up. A ham is always wanting to try something like this right! I setup at the base of the light and worked four more islands. I also worked KK4DIV on four additional bands. I had 23 contacts for the day and nine islands. I figure I got a good percentage of the islands that were active. That is me up there untangling a ball of line before dropping it over the side. On Sunday Linda, Suzy and I returned to the beach behind the light. Suzy enjoys the sand but does not want to get in the water. Although, she got close and the waves chased her back. I setup with the KX3 and the Chameleon Vertical. I got seven contacts on 20 meters. One was Fred VE3FAL. Fred was using the You Kits TJ2B hand held rig. 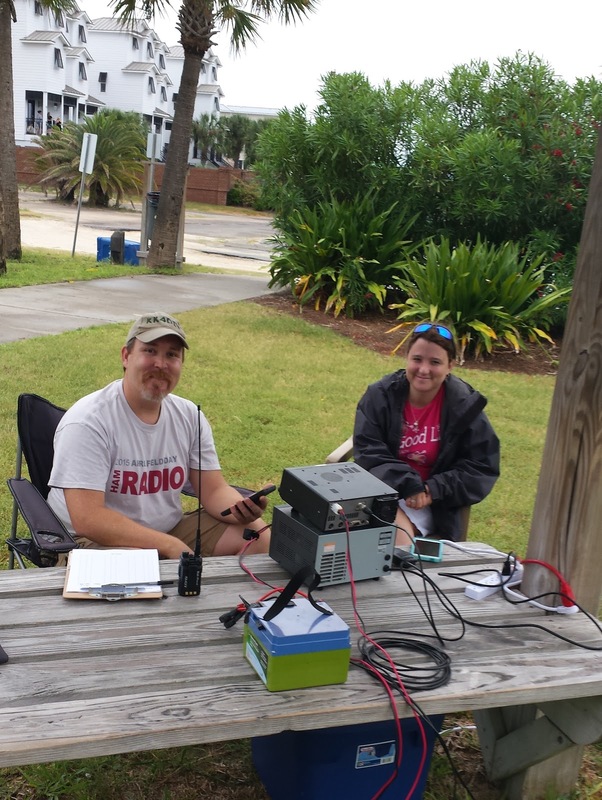 Thanks to the St. George Island Lighthouse Association for having us hams. And thanks to Jim the Lighthouse Keeper for his assistance.